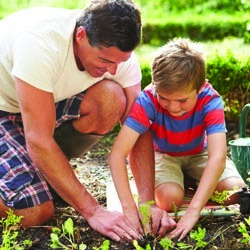 By gardening with your children or grandchildren, you can give them an awareness and appreciation of nature and the world around them that will stay with them for the rest of their lives. Even very young children enjoy helping with simple garden chores such as weeding, spreading mulch and harvesting. Older children love to have their own special garden to look after. This could be as small as several containers on the deck or as big as your whole yard, depending on their (and your) time, willingness and patience. To start out, you might give them a section of your garden to plant and look after. First, be sure to teach your budding gardener the value of improving the soil with organic material before they begin planting. Explain how organic material improves the texture of the soil and adds some food for the plants as well. Since improving the soil will make them more successful, they’ll be willing to garden again next spring. There are special kid-friendly tools available, just right for small hands to manipulate and since children love getting dirty, you’ll not be short of volunteers when the digging begins! Many colorful blooming plants as well as plants with unusual flowers, oddly-shaped leaves or crazy seeds will appeal to a child’s imagination. Consider smiling pansy faces and nodding columbines in the spring and snapdragons to snap and silver coins from the money plant (Lunaria biennis) in summer. In the fall, blue balloon flowers (Platycodon grandiflora) and the bright orange seed cases of Chinese lantern (Physalis franchettii) are fun options. Stroke the silky-soft, silver leaves of lamb’s ears (Stachys byzantina) – now you’ll know how it got its name. Or, feel the papery flowers of thrift (Armeria maritima) or strawflowers, the ferny foliage of yarrow or the succulent foliage of sedum. Even thorny plants such as raspberries or roses can engage a child’s sense of touch – carefully of course! 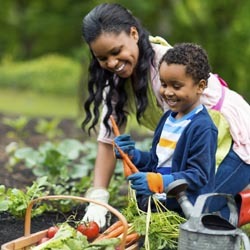 Growing vegetables is always fun and rewarding for children. If you have the space, it’s always exciting to grow pumpkins for Halloween or weird and wonderful gourds. Other easy to grow vegetables include radishes, carrots, peas, lettuce and cherry tomatoes. And don’t forget fruits like strawberries, rhubarb and watermelon. At harvest time let your child host a ‘salad party’ to share their bounty with family and friends. There are many scented flowers to choose from, including perennial peonies and lilies, as well as annual sweet alyssum and heliotrope. 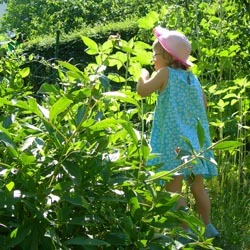 Let kids select herbs with fragrant foliage too. Mint is always popular but be sure to allow room for it to spread. Choose varieties with interesting names like chocolate, apple or grapefruit to capture a young gardener’s imagination. Use the pineapple-flavored leaves of pineapple sage in iced tea and watch the hummingbirds gather around this herb’s bright red flowers! The whirring of hummingbird wings, the song of a bird, the rustling of foliage or flowers in a breeze – these are all sounds that you and your child can share in a garden. Take time out from your gardening chores every now and then to listen. 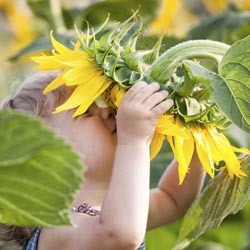 So, bring in your child and let us help you get started on that most special garden of all, a child’s garden.